Some biologists teach that all dinosaurs became extinct because they simply could not adapt to the dramatic climate changes that shook the earth at that time. 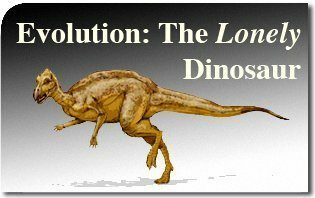 According to the dogma of “survival of the fittest,” the demise of the dinosaurs is a tragic example of what happens when there is a failure to evolve. However, in their enthusiasm to declare the triumph of evolutionary theory, evolutionary theorists have overlooked one lonely dinosaur that stubbornly clings to life amid the most adverse conditions seeming to disprove their theory. That lonely dinosaur is figuratively speaking evolution itself. No scientific theory has endured so much criticism and rejection. If left to its own devices, it would have long died out. But it is artificially sustained by a liberal establishment that provides the rarified air for the dinosaur to survive. However, a recent national survey seems to suggest that even those who are supposed to be its most ardent supporters seem to want to let the poor beast die in peace. Indeed a recent survey of over 900 public high school biology teachers, those in the front line in the evolution battlefield, are waning in their support of the controversial theory. It found that only 28 percent cling to pure evolution theory. Another 13 percent explicitly promote creationism in a positive light and a cautious 60 percent avoid controversy altogether by endorsing neither one nor the other. According to the evolutionary own dogma, such a dramatic situation should force some kind of adjustment. Yet Darwin seems frozen in time. Evolutionists simply refuse to respond to challenges to Darwin’s infallibility. The survey, published in the Jan. 28 issue of Science, found the hostile attitude toward evolution in public schools to be spread evenly throughout the country. Teachers often explained evolution as a subject required by state examinations but which students need not believe in. The survey indignantly reports that teachers often tell students that are free to choose between evolution or creation according to their own beliefs. It seems the students themselves are asking embarrassing questions since the survey recommend that the cautious 60 percent might benefit from more training so as to explain better the controversial topic to the skeptics. Randy Moore, a professor of biology at the University of Minnesota, sees the trend as just short of rebellion. If something is not done soon, the lonely dinosaur will die from lack of rarefied air. Maybe it is time to tell the liberal establishment to let the dinosaur evolve into something more believable.